Can someone who is a sweetheart also have fierceness in them? Well, according to Quinnipiac women’s basketball head coach Tricia Fabbri, not only is it possible, it’s admirable. Sweet and fierce are two of the many words she would use to describe Paula Strautmane, a 6-foot-1-inch, junior forward from Latvia. Strautmane established herself as one of the key pieces to the Bobcats’ MAAC regular season champion squad this year, signaling a long road from where she began in Latvia. Growing up, Strautmane’s parents were gym teachers and they introduced her to all sorts of sports. But it was her younger sister, Digna, that got her into the sport. Strautmane couldn’t get into that first practice because she didn’t have a jersey, but she got into the next one. Once Strautmane started playing, she didn’t look back. She remained committed to the game throughout her childhood, going to specific schools in Latvia to play basketball. Even though Strautmane was good at basketball as a child, she only viewed it as a hobby. But in the summer of 2013, the sport that was just a hobby that began to change her life. Strautmane had been named to the U16 Latvian National Team for the 2013 U16 Euro Championships. In the tournament, Strautmane finished in the top 10 in field goal percentage, assists, defensive rebounds and total rebounds. Some schools in the United States found out about the Latvian basketball player and expressed some interest, giving Strautmane the realization that she could play collegiate basketball in America. Quinnipiac found out about Strautmane in the summer of 2014 when she was playing in the U18 European Championships for the U18 Latvian National Team. 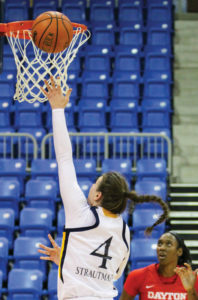 In that tournament, she ranked in the top 10 in blocks, offensive rebounds, total rebounds and field goal percentage and caught Quinnipiac associate head coach Mountain MacGillivray’s eye. Strautmane quickly narrowed her list down to two schools: Quinnipiac and the University of South Florida. Luckily for the Bobcats, they didn’t have to do much to convince her, even with a friend of Strautmane’s at South Florida. When she moved to America in August 2015, Strautmane recognized that everything was different from her homeland, whether it was the food, culture, social interactions or what people wore. But as time has gone on, Strautmane has become more comfortable at Quinnipiac. Fabbri, as well as Strautmane, credit the other players for making Quinnipiac feel like home for international players. 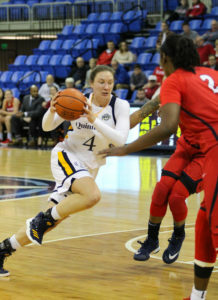 In 2017, Strautmane may have had the best year of her basketball career as she was not only apart of the Quinnipiac squad that made the Sweet 16 in the NCAA Tournament, she also had the chance to play for the Latvian National Team in the EuroBasket Women 2017 Championship. Strautmane didn’t garner much playing time in the EuroBasket tournament (only averaging just 1.9 minutes per game), but was happy to represent her country. Now, in her junior season, it feels like everything’s coming together for Strautmane. She’s played for her country’s senior team, her collegiate team looks poised to make another run into the NCAA Tournament and her sister that got her playing the sport is also in the United States, playing basketball for Syracuse. And to add to that, Strautmane, who is an engineering major, made the 2016-17 MAAC All-Academic team. So, what has made Strautmane’s move to America so successful?